February 15, 2016. On the fourth and last day of our Valentine’s trip, we decided to go biking like Belgians. Let me preface this with the fact that I’m a horrible cyclist. I stopped riding a bike at age ten and never really learned how to use handbrakes or gears. That’s why, when we’re at home, we ride a 1971 Schwinn Twinn tandem that Matthew purchased in a garage sale. He gets to man the helm while I provide the rear horsepower. Our first date was on that bike 26 years ago, so the arrangement seems to be working. Anyway, since Belgians are into biking, we figured they’d be bound to have a tandem for rent somewhere. Sure enough, we found two in stock at a bike rental place near our hotel. It took us a while to locate the owner, who as it turns out, also runs the beauty salon upstairs. But in short order we paid the man the equivalent of $20 for a half-day rental and took off along the bumpy cobblestone streets. Our destination? Damme. Nope, that’s not a curse, nor a water control device, but a tiny village that was once a bustling port before the harbor silted in and the sea retreated. At only 45 minutes away, it seemed like a doable distance for two folks who’ve been out of the saddle for more than a year. So we headed out on the prescribed path as detailed in Rick Steves’ guidebook. Note the incredible numbers of bobbins used to make the lace collar in back. The work is all done by hand, and watching nimble fingers flip these myriad bobbins back and forth to create the pattern is hypnotizing. Click on the image to see it up close. The brooch is modern, but the lace inside is “Point d’Alençon” needlepoint, cut from the remnant of a collar dating to 1785. I thought it was pretty reasonable ($90), considering its age. 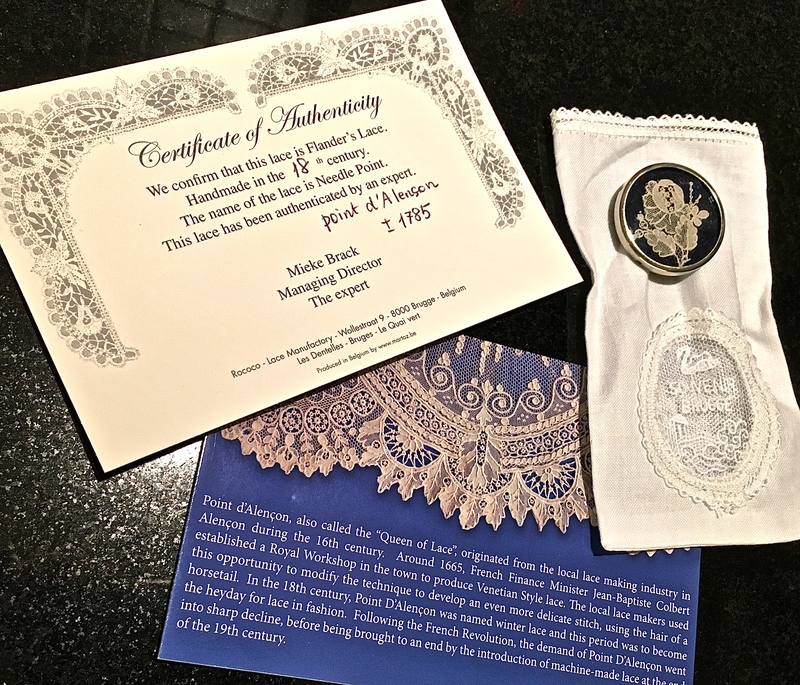 A fifth-generation lace-maker owns the shop, although the art form is dying, and the jury is still out as to whether the sixth generation will continue the tradition. But seeing high-quality lace up close and watching the insane human dexterity that goes into creating the stuff really gives you an appreciation for it. And yes, I went home with a few “Matthew-approved” pieces, including the antique trinket on the right. Bobbin lace is made by weaving, twisting, and braiding the threads together, a bit like macrame. Look how many bobbins are involved in making just this simple ribbon lace. The piece is all done by hand, all by one person. Her fingers fly so fast that you can’t see how she’s following the pattern, which is pricked into the paper underneath. These are different kinds of needle lace. As the name implies, it’s akin to needlepoint, where the patterns are hand-stitched using a needle and thread. Small embroidered pieces can be overlapped to create depth and 3-D texture, like that seen in the Point d’Aleçon piece I purchased. Fun Fact: Point d’Alençon from the mid 1600s was made of hair taken from horses’ tails — a finer thread than can be made today. It had the name “winter’s lace” due to it’s off-white color. Sometimes it’s called the Queen of Lace because of its intricacy. Needle and bobbin lace can also be combined using different techniques to create other styles like those pictured here. 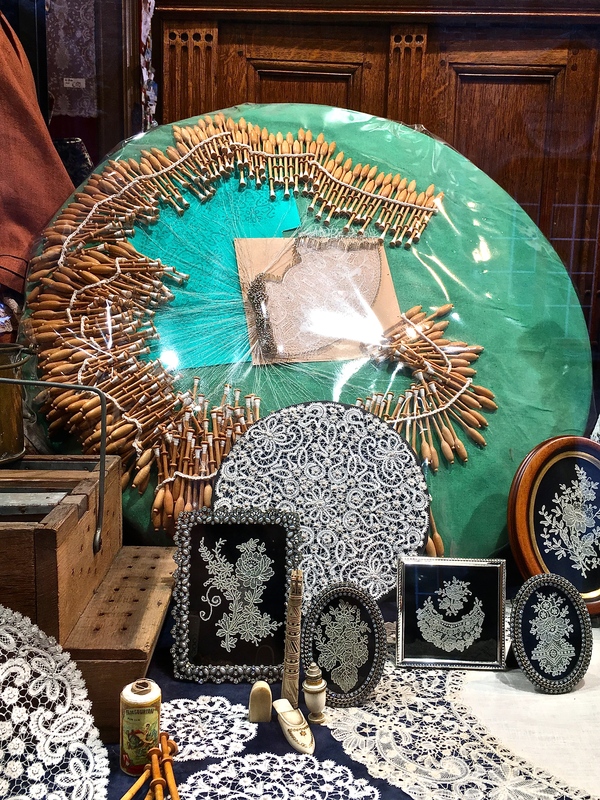 Lacemakers follow paper patterns. I can’t imagine how someone sees the details of the instructions, much less the thread itself. Notice how even the little painted bobbins hold miniature works of art. 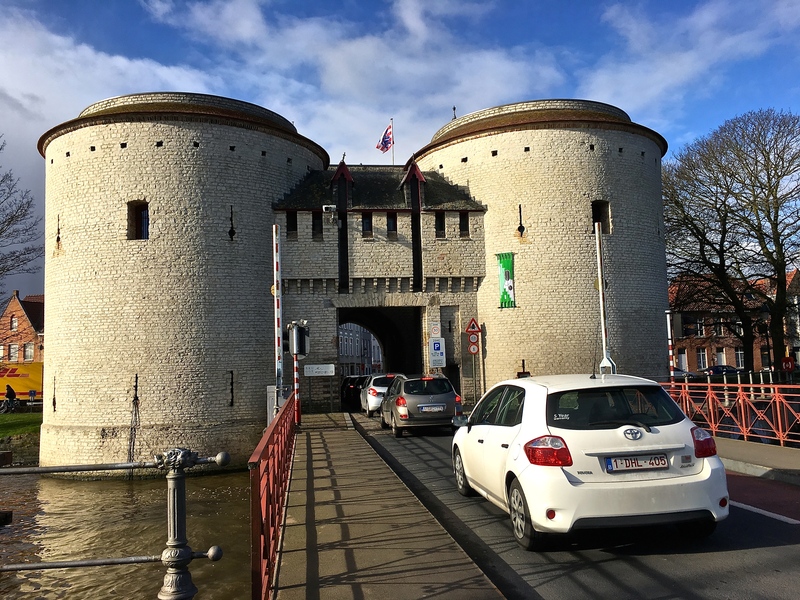 The Holy Roman Emperor Charles V, Napoleon, and the German army all entered Bruges through this gate, known as the Kruispoort. Back on the road again, we came upon one of the old Medieval gateways into Bruges. It dates back to 1400, when the entire city was surrounded by a wall and a moat (the moat has evolved into a canal that now encircles the city). Only three of these ancient ports still stand, but originally there were several, all acting like drawbridges. It’s hard to believe that they’re still in operation, with cars and trucks lining up to squeeze through for the novelty of the experience. This is the interior view of the Kruisport, as would have been seen from inside the city walls, which have long been demolished. Nothing but the gateways are left of the old ramparts that once encircled the city. Yep, even city buses barrel through the old gateway. 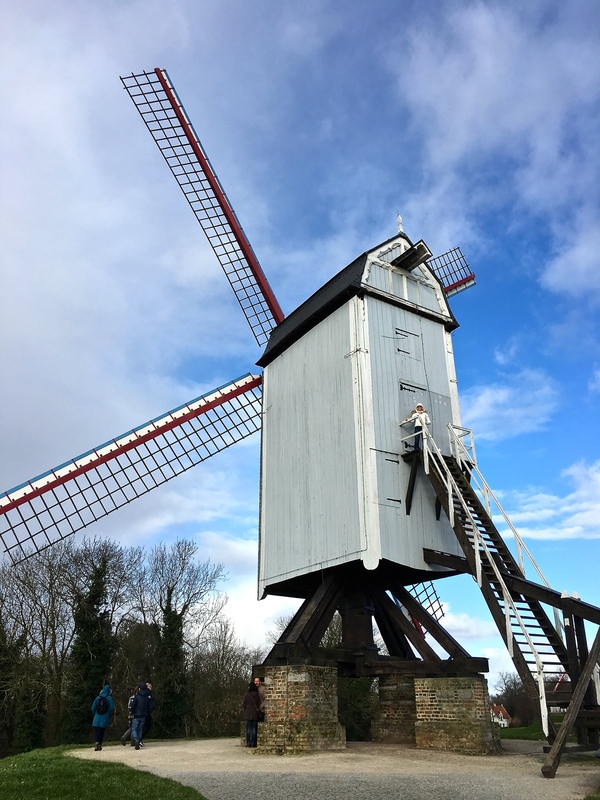 The Bonne Chiere post windmill (1911) was relocated from elsewhere in Belgium to the edge of Bruges. A closeup shows the post that the building pivots around. Can you imagine how much effort it took to crank this baby into the wind? On our way home, I had to snap another shot of the classic windmill silhouette. Matthew enjoys some sun on his face sitting at the window of the cute De Windmolen Cafe. The stuff you see hanging from the rafters is a length of drying hop-vine for making beer. 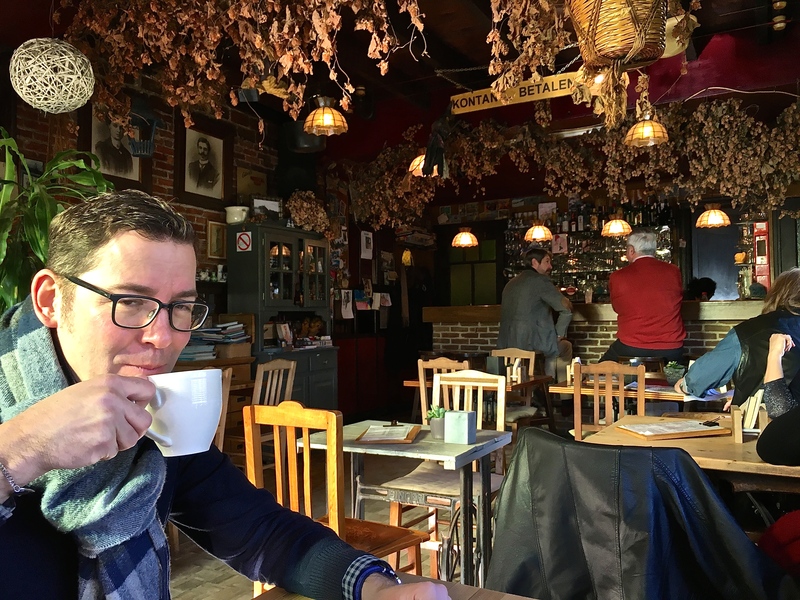 After getting whipped by the bracing breezes atop Windmill Hill, we decided it was time for a warmup, so we found De Windmolen — an incredibly cute little cafe almost kitty-corner to the Bonne Chiere mill. I’m sure that in season it must get tons of tourist traffic. But on the day we were there, it felt authentically Belgian, frequented only by locals sipping beer at the bar. We snuggled inside to enjoy a cup of Belgian hot chocolate and a delicious piece of buttery cake before heading back out on the trail. Check out the family car perched atop the houseboat section of the barge. Some even came equipped with landscaped patio gardens. Just as we were about to cross over the canal to continue our journey, a passing flotilla forced the raising of the bridge. So we settled ourselves along the waterway to watch the barges go by. Most appeared to be part houseboat, part shipping container. The front seemed to be reserved for hauling goods, while the rear acted as the homestead. Think of of a barge like the mullet of boats — business in the front, party in the back. The lifestyle looked so appealing that Matthew and I put it on our list of potential retirement plans. I’m sure it’s an easy and affordable way to live (wink, wink). 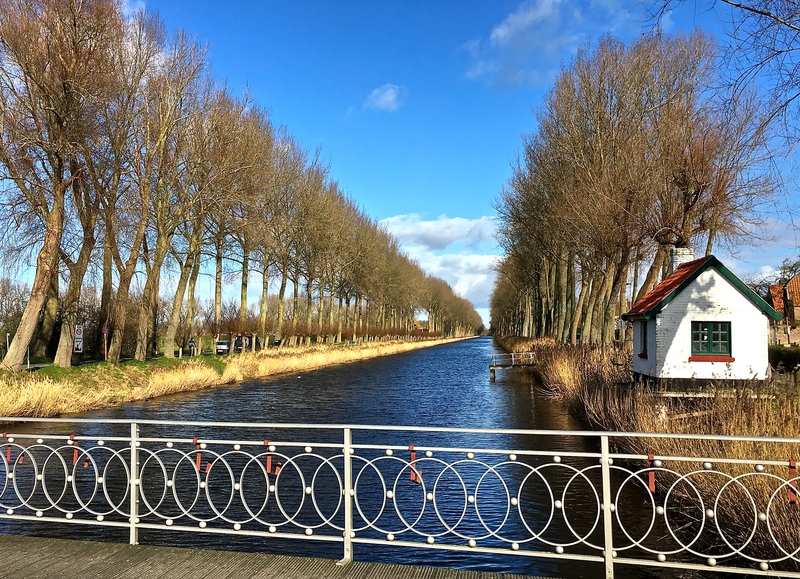 Rows of trees and quaint houses border the stick-straight Damme Canal (also known as the Napoleon Canal), built in 1811. 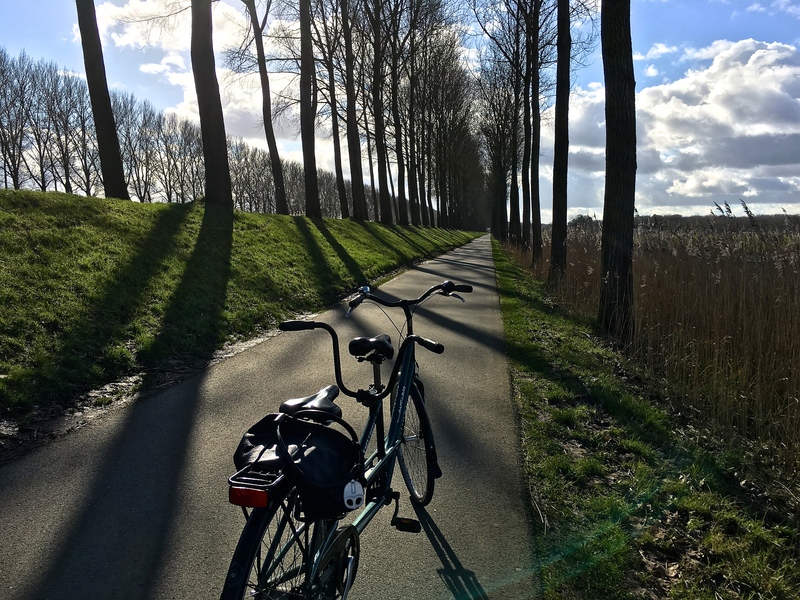 Eventually, we found ourselves biking alongside the Damme Canal. Napoleon himself had a thing for Bruges and Damme (he visited them twice, once with each wife.) His goal was to reinvigorate the area as a port by dredging a waterway to the sea. The dredging worked, but the revitalization plan didn’t. I will say, however, his efforts paid off in that tourists who are willing to take to two wheels and venture the canal path are spectacularly rewarded with a beautiful view of the Belgian countryside. Built in 1867, the Schellemolen (Schelle Windmill) is a tower mill, meaning only the brown cap turns to face the wind. The rest of the building stays put, unlike post windmills. Despite riding on level terrain, we were surprised to find ourselves needing to stop numerous times to catch our breath. The headwind was a force to be reckoned with. But fortunately, all our moments of collapse landed us in spots littered with picture-perfect homes and farms. Standing tall amongst these beauties was yet another windmill, a tower mill this time. Its front yard sheltered adorable sheep and a shaggy dray-horse, who lay munching on the grass. Matthew parks the tandem in front of Tante Marie’s, which is situated along the quaint main thoroughfare in Damme. 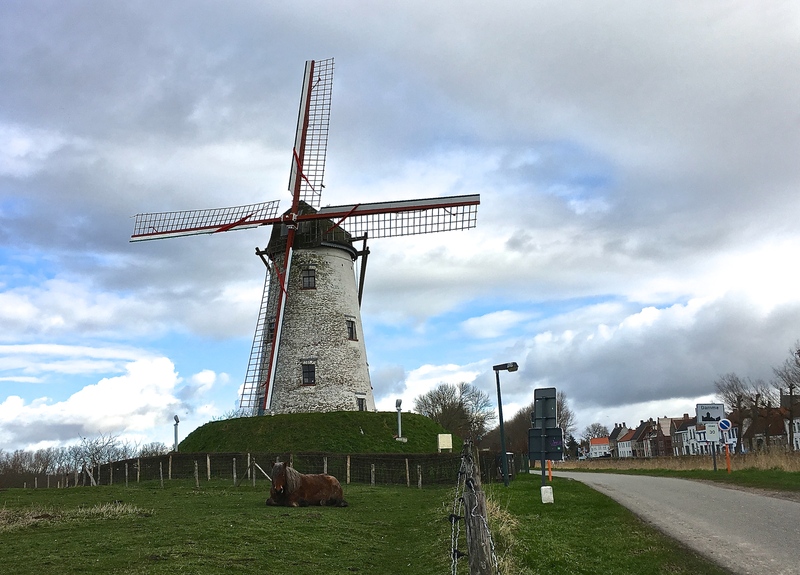 Luckily, the village of Damme was located almost directly across from the windmill. I say luckily because, with all our dawdling, we were coming perilously close to the end of our four-hour bike rental contract. So we made a whirlwind tour of the town sights, and then stopped for a quick but fabulous lunch of quiche Lorraine and croque monsieur at Tante Marie’s — another too-cute-for-words cafe. The race back to Bruges left us just enough time to grab our bags and head off to the Brussel’s airport … pant, pant, pant. Next time, we’ll allow a full day for Damme and more time just to sit canal-side and take in the tranquility of it all. The area was once a salt marsh. Many homes still sit on little islands surrounded by swampy terrain. Tons of waterbirds make their homes in the canal and along its marshy banks. Here, a cormorant stretches its wings in what is sometimes called the “cormorant crucifix pose.” Scientists think this posture helps the bird air-dry its wings after diving deep to catch food. The Eurasian Coot (Fulica atra) is one of my favorite birds. Look at his adorable, blue-toed feet. They’re lobed, to help him walk on marshy shorelines and to aid in a running takeoff from the water. Napoleon wanted his canal to mimic the grand boulevards of Paris and run straight from Bruges’ Our Lady Cathedral to the sea. 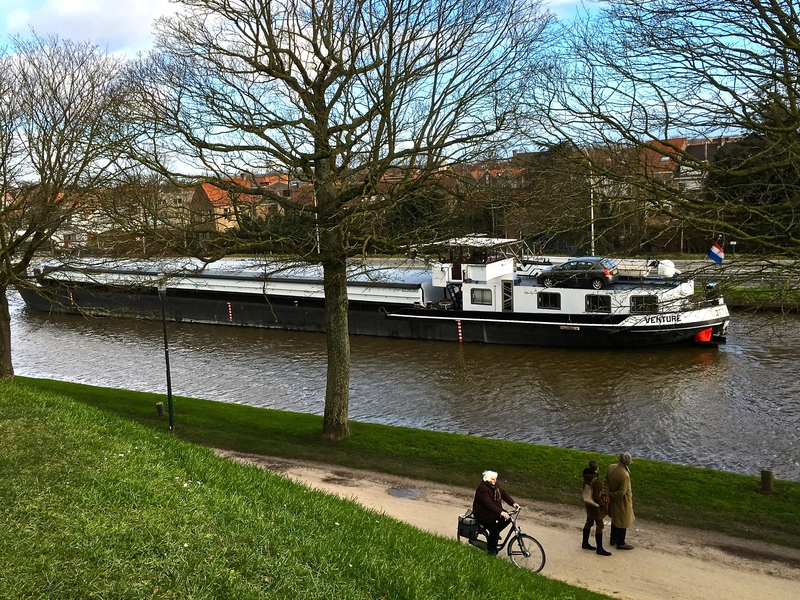 A cute little “riverboat” sits next to Damme. 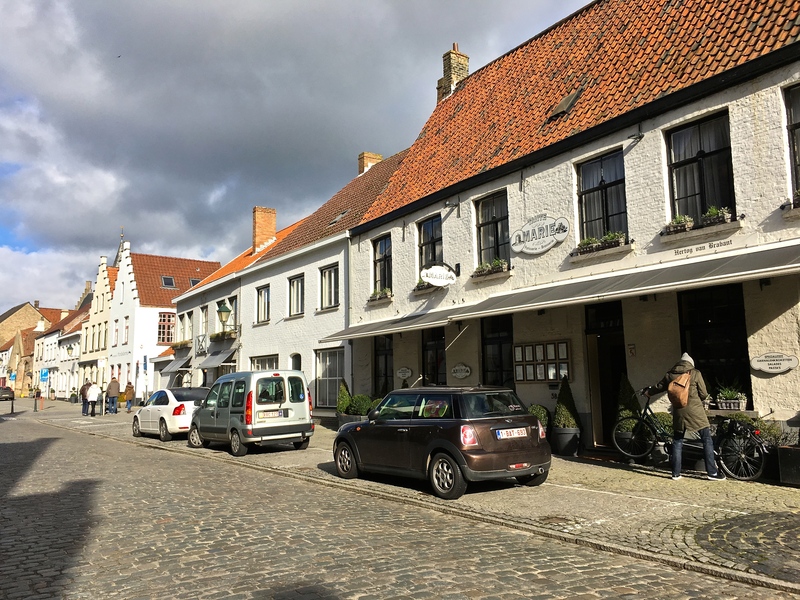 Damme’s stately 15th-century City Hall, made of limestone while everything else is made of brick, points to the wealth that herring fishing once brought into the town. Behind Damme’s Church of Our Lady are the evocative remnants of its bell tower. A cute little lamb and its mamma nibbled green grass in one of the most groundhog-eaten pastures I’ve ever seen. Or maybe it’s some kind of prairie dog community? Our delicious meal at Tante Marie’s. Matthew looks none too pleased about pausing for photos — he was plumb tuckered out from the ride and in need of fuel.